With the first miscarriage in October of 2003, I barely even knew I was pregnant. We hadn’t told anyone when I started bleeding at six weeks. I was upset by it – and even more so by the fact that a woman in my office who wasn’t married or in a relationship got pregnant the exact same week. A woman who had continually made my work life difficult, and who, at the time, as harsh as it sounds, I felt didn’t deserve a baby. My jealousy over her pregnancy colored are already difficult relationship. 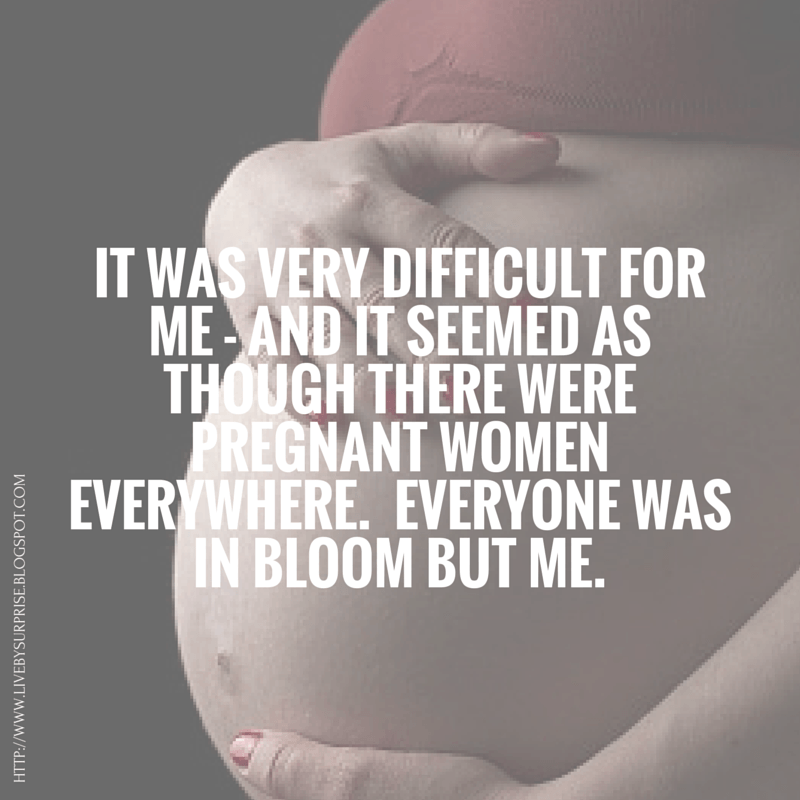 It was very difficult for me – and it seemed as though there were pregnant women everywhere. Everyone was in bloom but me. Although I didn’t acknowledge it at the time, my relationship with my ex was already on the downward slide. His mental health issues were becoming more prevalent – and his demands were getting more frequent. I think the miscarriage troubled him as well – although we never really discussed it. I took a break from our marriage and lived with my mother for a short time. I can’t really explain why – but I did go back. Around nine months after the miscarriage, I got pregnant again in April of 2004. This time, I was certain that everything was going to be different. I started little rituals – trying to convince myself that it was different this time because I did one thing or the other differently. As we hadn’t told anyone last time, we announced early this time. I started eating very healthily. Sadly, this child was not meant to be either – and at ten weeks, I miscarried again. My ex completely disengaged almost from the point that I found out that I was pregnant. He refused to take me to the hospital when I started bleeding. He provided absolutely no support when I returned – treating me sullenly like it was my fault. I had placed the blame squarely on my own shoulders as well. There must have been something I’d done wrong to cause it. Yet again, a woman in my life fell pregnant at exactly the same time. And this time, it was someone even closer – I watched as my sister-in-law (my husband’s sister). To make things even more difficult, I had made arrangements for my sister-in-law to be hired into the company I was working at just before I became pregnant. Just after I miscarried, we were up for the same position and although I believed that she hadn’t been chosen for an interview, my employer interviewed her at another location, and ultimately she was given the job. I wouldn’t have had a problem with it if either my employer or my sister-in-law had been up front with me – but that in combination with the miscarriage caused a real rift in my husband’s family. And then suddenly, she wasn’t pregnant either. I never got the full story – no one ever admitted to a miscarriage – and truthfully now I’m not certain if she actually was pregnant or if she was just jealous that her family was giving me attention (yes, she was/is that screwed up). When I got pregnant with my son I remember just being scared. Every day. This time I didn’t tell anyone I was pregnant (although my mother guessed…I guess moms always know). I was working about an hour and a half travel away in a fairly fast-paced, high volume shop. It meant early mornings and late evenings – and I just threw myself into it to avoid thinking about the pregnancy. I wasn’t taking care of myself, I wasn’t eating well. I was doing everything I could to avoid thinking about what I thought was the inevitable result. At ten weeks pregnant at an early morning work meeting, I leaned over to my co-worker next to me at the conference table, and promptly passed out. There are few times I’ve ever been that frightened. I was mad at myself. I knew that I’d been abusing myself – avoiding getting attached to the child inside me as I was convinced he wasn’t to be. When I came to a few moments later, they’d already called the ambulance. My mother joined me in the hospital – my ex couldn’t be bothered to come. They did an ultrasound. And there he was. Little Puck. I could see his outline on the screen. I couldn’t see the heartbeat – but the technician and my mother insisted it was there – and it was strong. From that day forward, I became more and more confident. I started treating myself better. I cut back on the extra hours – and started getting more sleep. I ate and ate and ate. I gained sixty pounds that pregnancy. And ten days after my due date after a very difficult labor and emergency c-section, I had a very chubby 9.7 lb baby boy. It was a long and difficult journey. And, truth be told, my marriage was in very bad shape at that point. But every moment – even all the heartbreak – was worth it – just to hold this perfectly lovely little boy in my arms. ← #1000Speak Compassion for the Earth!